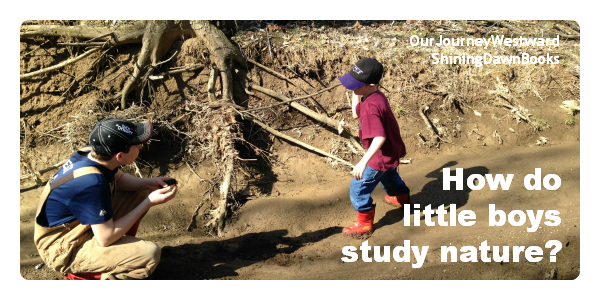 How do little boys study nature? Oh my goodness, I love boys. Learning is such an active adventure with them! I remember taking early elementary nature walks with my teen daughter and they were, oh, so very different. She and I would quietly admire the intricacies of a flower or sit peacefully in a bird blind to catch a glimpse of various birds to sketch. My boys are quite different (to say the least.) Ever since they joined in on our nature walks, the birds haven’t often graced us with their presence, if you know what I mean. Our walks now are much louder, faster-paced, and full of everything the five senses have to offer. Touching being the biggie of the five senses. Boys get IN nature – literally. Every step of the way, my little man was not so much observing nature, but becoming a part of it as much as possible. 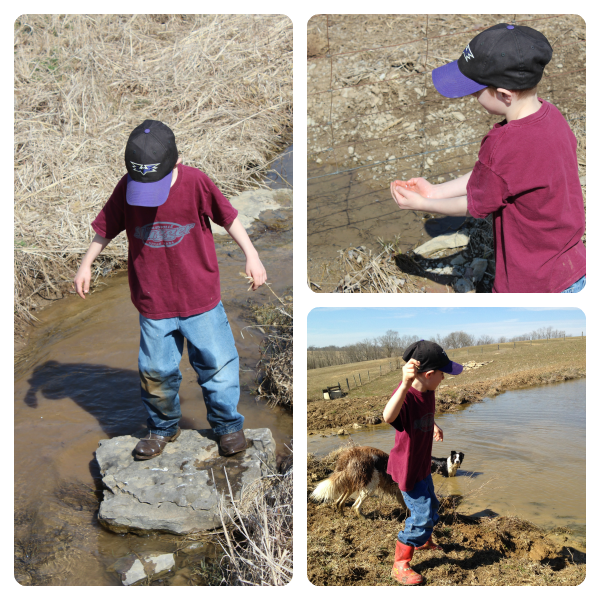 He walked in the stream, slid down a steep bank to walk in the dry creek bed, and wasn’t afraid to let the mud nearly hold his boots hostage when we came across moist land. Boys touch nature – as often as they can. And they touch it with their whole bodies when you allow. 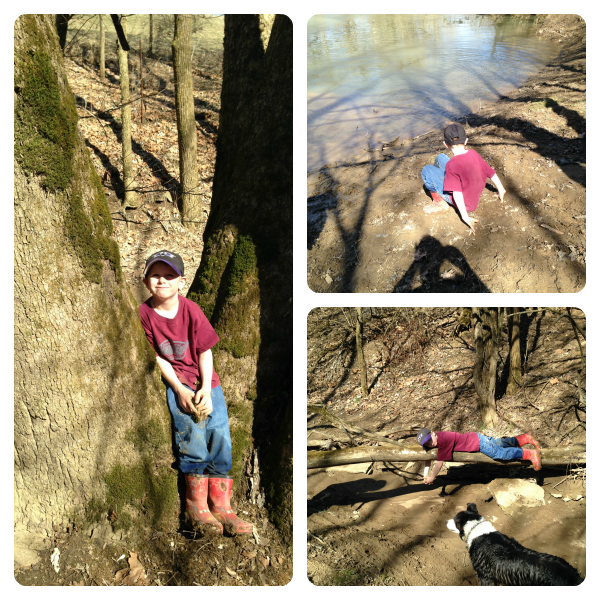 Sloshing water, catching bugs, skipping rocks, throwing mud balls, climbing trees…sound familiar? Boys use nature – for their own purposes. Building log bridges over a stream, digging holes to bury treasures and decorating branches with mud ball art are just a few instances from our walk. You’ll probably laugh to know that during each of these moments I’m right alongside trying to find teachable things to share, while Eli busily goes about his own business. Even when I don’t think he’s really listening, he catches just about everything I say. Boys put everything they have into nature. Rather than seeing the moss on a tree, boys see the awesome seat meant just for them. Rather than seeing the mud on the bank of the creek that will get their pants dirty, boys see a perfect place to sit and take it all in. Rather than talk about the reason a tree might have fallen, boys see the perfect balancing beam on which to walk or rest. Ugh. Will they ever learn? 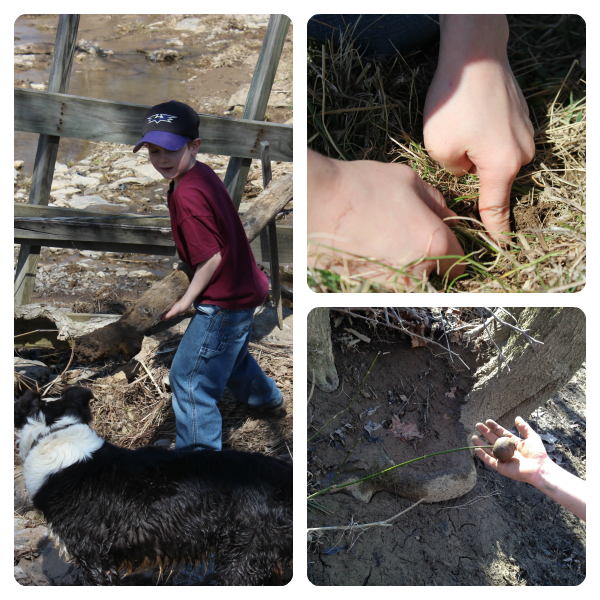 As moms, we could easily get frustrated that our active boys don’t seem to be listening to our “lessons” about nature. I’ve learned over the years, though, that much more learning than you can imagine is taking place through all these moments of pure blissfulness for our sons. They’re learning through the activity – through the touch – through the climbing… Little boys study nature – just not always in the way we think nature study “should” happen. He’ll learn, momma. He’ll learn. NaturExplorers: Meeting the needs of ALL types of learners! Your son reminds me of all of my kids- including my girls (minus the 14 year old). I just took them on a nature walk over the weekend, and, well, it wasn’t much of a walk. 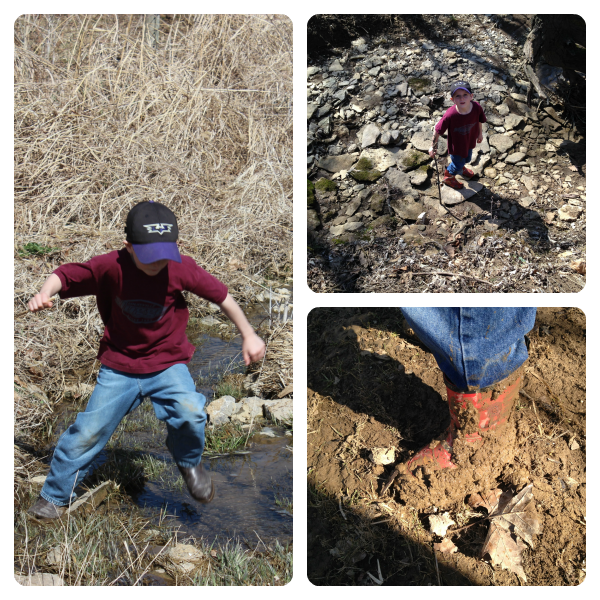 We stopped a lot to look for tadpoles, climb rocks and trees, and check out animal prints. They got awfully muddy, and I spent time talking to them about moss and deciduous trees. My 6 year old brought some moss home and we studied how it grows and eats. So, anyway…sigh…my girls are always walking around with “slug juice” stuck to their hands, just like my boys! I love your description of studying nature with boys. Everyday is an adventure with my little boy! Today’s walk around the lake included lots of mud, big sticks, and rocks. Then when we returned home, he was playing with worms he found outside. good times! My 16-year-old, Alexis, is like your daughter. My 11-year-old, Lorelai, is like your boys. Then again, so am I. 😀 My favorite hike was during which it began raining and we went off-path. We came home with mud all over us. I love that! What a great nature walk memory!